Top Rank will stage an intriguing lightweight title fight in Omaha, Neb., on Saturday when Terence "Bud" Crawford makes the first defense of his WBO belt against talented chronic underachiever Yuriorkis Gamboa. But June 28 will always be known best as the anniversary of the most infamous fight in boxing history, when Mike Tyson twice bit Evander Holyfield on the ears in the third round of their heavyweight championship match in 1997 at the MGM Grand in Las Vegas. Saturday is the 17th anniversary of "The Bite Fight," and the action in the ring has been analyzed repeatedly in the years since then. The fighters have long since come to grips with what happened and have become fast friends. But what is overlooked is the sad aftermath of that fight. Neither fighter was ever the same after that night, and many of the key figures in the event have either passed away, gotten ill or left the sport. Tyson was just two days away from his 31st birthday on fight night, and despite being stopped by Holyfield eight months earlier in their first fight, he was still a fearsome figure. He was 45-2, with his only losses coming against Holyfield and Buster Douglas. He had his license revoked by the Nevada Athletic Commission following the fight, and he was out of the sport for 19 months. After he was re-licensed, he admitted he tried to break Frans Botha's arm in his first bout back. In his second, he hit Orlin Norris after the bell had rung to end the first round, and Norris injured a knee when he fell and couldn't continue. At a disciplinary hearing after that bout, current UFC CEO Lorenzo Fertitta, then a member of the Nevada commission, suggested not too subtly that Tyson find another place to fight. At that point, Tyson had fought 11 of his previous 13 bouts in Las Vegas, including his previous six. 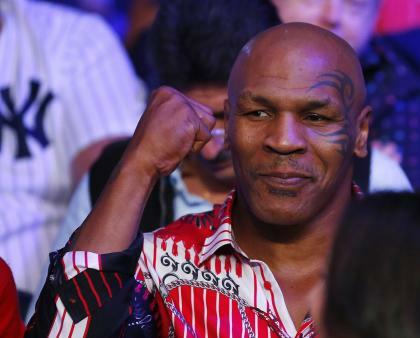 Tyson, though, was never the same fighter. After biting Holyfield, he fought off and on for almost eight full years. He went 5-3 with two no contests in that span and never had another significant win. His victories post-Holyfield were over Botha, Julius Francis, Lou Savarese, Brian Nielsen and Cliff Etienne. He was beaten by Lennox Lewis, Danny Williams and Kevin McBride. 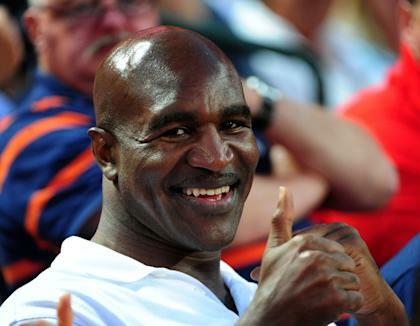 Holyfield was 33 when he rematched Tyson, but he only had marginally more success following "The Bite Fight" than Tyson. Holyfield was at his career peak on that night, and came out with another great performance in his next outing when he stopped Michael Moorer at the Thomas & Mack Center in Las Vegas on Nov. 8, 1997. But including the Moorer fight, Holyfield went 10-7-2 with a no contest after the 'Bite Fight.' His only signfiicant victory after the Tyson rematch was over Moorer, though his 2002 technical decision win over Hasim Rahman might be regarded as a big win by some. His other wins, though, were decidedly less impressive. He was 1-1-1 in a series of desultory fights with Johnny Ruiz. He got a gift draw in his first fight with Lewis, but then was beaten cleanly with no controversry in the rematch. He lost three in a row after beating Rahman, dropping bouts to Chris Byrd, James Toney and Larry Donald. Toney was a middleweight when Holyfield first won the heavyweight title in 1990 by knocking out Buster Douglas. Holyfield hung around until he was 48 years old, fighting the likes of Nielsen, Sherman "The Tank" Williams, Jeremy Bates and Vinny Maddalone. But Tyson and Holyfield weren't the only ones involved with "The Bite Fight" who had bad outcomes after it. Mitch Halpern had initially been assigned to referee the rematch, as he had done for their first fight. But Tyson's camp objected to Halpern and on the day before the fight, Halpern, not wanting to put the attention on himself, withdrew. 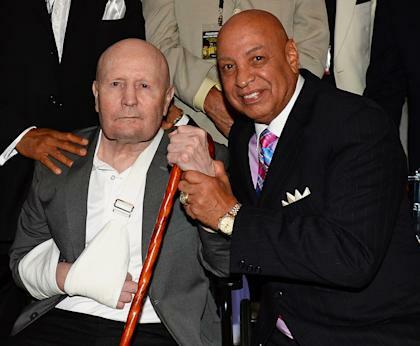 Nevada appointed Mills Lane as the referee in his place. Tragically, Halpern died at just 33 years old after committing suicide on Aug. 20, 2000. Lane officiated the bout in Halpern's place and was the man who disqualified Tyson. Lane retired as a referee after working a bout between Tommy Hearns and Jay Snyder on Nov. 6, 1998. He suffered a debilitating stroke in March 2002 and remains confined to a wheelchair. Marc Ratner, who was the executive director of the Nevada commisison and thus was the chief regulator of Tyson-Holyfield II, resigned that post in 2006 to take a job with the UFC, where he works for Fertitta. Dr. Elias Ghanem was the commission chairman for both Tyson-Holyfield fights. He was widely respected in Nevada, where he was known as the "Doctor to the Stars." Among his famous patients were Elvis Presley, Liberace, Ann Margret, the Osmonds, Johnny Cash, Lou Rawls and Tim Conway. Ghanem got cancer and after a long struggle died in 2001 at 62. The fight was one of the most anticipated in history, and will never be forgotten because of what occurred in the ring. But the lives of so many were changed dramatically afterward, and it won't be forgotten because of those reasons.